A classic! 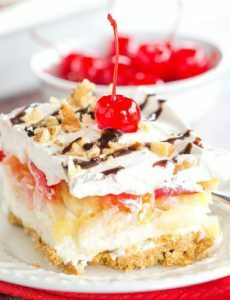 Layers of graham cracker crust, cream cheese filling, bananas, pineapple, strawberries, whipped cream, nuts, chocolate & a cherry on top! Grease a 9x13-inch baking dish; set aside. In a medium bowl, mix the graham cracker crumbs and melted butter with a fork, stirring until all of the crumbs are evenly moistened. Dump the crumbs into the prepared pan and press into an even layer. Refrigerate while you prepare the next layer. In a medium bowl, mix together the cream cheese and sugar on medium speed until light and fluffy, about 3 minutes. Using a rubber spatula, fold in the Cool Whip until thoroughly combined. Spread the cream cheese mixture on top of the graham cracker crust. Arrange the banana slices in a single layer on top of the cream cheese filling, top with an even layer of the crushed pineapple, and then an even layer of the sliced strawberries. Cover with the Cool Whip, smoothing the top. Sprinkle with the chopped walnuts, then drizzle with chocolate syrup and top with maraschino cherries. Refrigerate for at least 4 hours, or overnight. Leftovers can be stored, covered, in the refrigerator for up to 4 days. You can use fresh whipped cream in place of the Cool Whip, both for the filling and the topping. If you do, plan on only keeping the leftovers for up to 2 days, as the fresh whipped cream will become watery as it sits in the refrigerator.